Today’s guest teachers are Navi-Sensei and Devon-Sensei. They volunteered to be our guest teachers one year ago. = Minasan, konnichiwa! Devon to Navi desu. = Hello everyone! Devon and Navi are here. = Kyou wa, “kamo shirenai” no tsukaikata wo oshiemasu yo. = iku kamo shiremasen / shirenai. = ikanai kamo shiremasen / shirenai. = itta kamo shiremasen / shirenai. = ikanakatta kamo shiremasen / shirenai. = benkyou shiteiru kamo shiremasen / shirenai. = benkyou shite inai kamo shiremasen / shirenai. = benkyou shite inakatta kamo shiremasen / shirenai. = inu kamo shiremasen / shirenai. = Inu de wa nai kamo shiremasen / shirenai. = Inu ja nai kamo shiremasen / shirenai. = Inu datta kamo shiremasen/ shirenai. = inu dewa nakatta kamo shiremasen / shirenai. = inu ja nakatta kamo shiremasen / shirenai. = isogashii kamo shiremasen / shirenai. = isogashiku nai kamo shiremasen / shirenai. = isogashiku nakatta kamo shiremasen / shirenai. = yuumei kamo shiremasen / shirenai. = yuumei datta kamo shiremasen/ shirenai. = Ashita wa ame kamo shirenai. = Ashita wa ame ga furu kamo shirenai. The speaker is not sure but guessing from what they see/ have heard. Note: Weather reporters don’t say かもしれない ( = kamo shirenai) when they forecast the weather. = Ashita wa, ame ga furu deshou. You wouldn’t say this in daily conversation. You sometimes add もしかしたら ( = moshika shitara) / ひょっとしたら ( = hyotto shitara) before the sentence when you emphasize the possibilities. = Hyotto shitara rainen, nihon ni iku kamo shirenai. = There is a possibility that I might go to Japan next year. = Moshikashitara Akane wa Tsukasa-kun no koto ga sukikamo shirenai. = I could be wrong but (I think) Akane might like Tsukasa. = Kono ressun wa minna niwa kantan kamo shiremasen. = This lesson might be easy for everyone. = Maggie sensei wa kibishi sugitta kamo shirenai. = Maggie sensei might have been too strict. = Kono hon wa musuko niwa muzukashii kamo shirenai. = This book might be difficult for my son. = Kare, tsukiatte iru hito ga iru kamo shirenai. = He might be seeing someone. = Nomikai ni ittara kanojo ga okoru kamo shirenai. = If I go to the drinking party, my girlfriend might be upset. = Reizouko ni mada biiru ga ni, san bon haitte iru kamo shirenai. = There might be a couple more beer in the refrigerator. = Ashita, netsu ga deru kamo shiremasen. = I might have a fever tomorrow. = Mou motte iru kamo shirenai kedo, douzo! = You might already have one but here you are. = Ie ni taberu mono ga nanimo nai kamo shirenai kara nanika katte kaerou. = There might be nothing to eat at home so I should buy something before I go home. = En ga agaru kamo shirenai kara ima no uchi ni ryougae shitahou ga iiyo. = The yen might go up so you should change money some now. = Kare wa mou neta kamo shirenai. = He might have gone to sleep already. = Dochirani shite mo kinou wa ikenakatta kamo shirenai. = I might have not been able to go yesterday anyway. = Dare ka watashitachi no kaiwa wo kiite ita kamo shirenai. = Someone might have listened to our conversation. 2) You sometimes drop しれない ( = shirenai) in conversation. = The post office might be closed by now. = Mou dare mo inai kamo. = Everybody might have already left. = Tashika, sonna koto itteta kamo. = If my memory serves correctly, he/she might have said something like that. = Ashita nara aite iru kamo. = I might be free tomorrow. You use かも ( = kamo) when you express your feelings / opinions in a subtle way. = Nozomi no koto ga suki. = Nozomi no koto ga suki kamo…. Like I have mentioned in many past lessons, Japanese people tend to avoid straight forward communication. 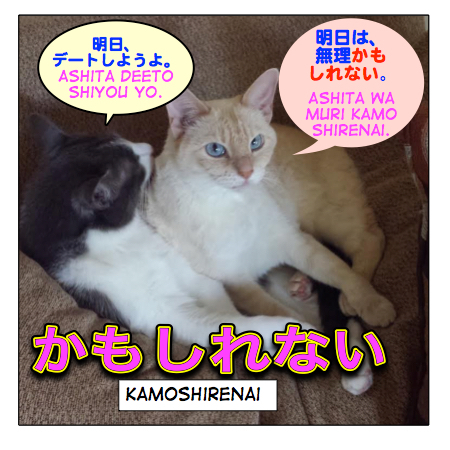 By adding かも ( = kamo) you can suggest your feelings in a subtle way. = I think it’s difficult. = It is kinda difficult. / It could be difficult. / This might be a little difficult. It may get annoying if you overuse it but I will show you more examples. even after they taste it. = I might be putting on some weight. = I might know why / the reason. ＝ Kono geemu omoshiroi kamo. = This game is kinda fun. = Sounds good! / That’s a good idea! = That might be working! / It is kinda cool. = Maybe it’s true. / That could be true. / It could be right. / You might be right. = You could be right. / That could be right. = You may be right. / Right. / True. / That’s possible. = ( I might be wrong but) I could be the cutest in the world. = Maybe you are right. = Devon Sensei, Navi Sensei, arigatou! = Thank you, Devon Sensei and Navi Sensei. = Watashi wa sekai de nibanme ni kawaii inu kamo. = I might be the second cutest dog in the world. When there’s something I don’t understand, I often find the answers on your site! Maggie sensei, your lessons are really helpful. Hontouni arigatou gozaimasu. Thank YOU for your comment. Sou kiite ureshii desu!